The Problem: Too many Americans lack the skills and technology needed to effectively use the internet and the tools and services it has to offer. Increasingly, Americans require a broadband internet connection to live, work, and interact. Yet far too many individuals, many of whom are members of historically overlooked and underserved communities, lack the skills, technologies, and supports needed to take advantage of the opportunities made available by a reliable broadband connection.1 Absent help, they are at risk of being left behind. 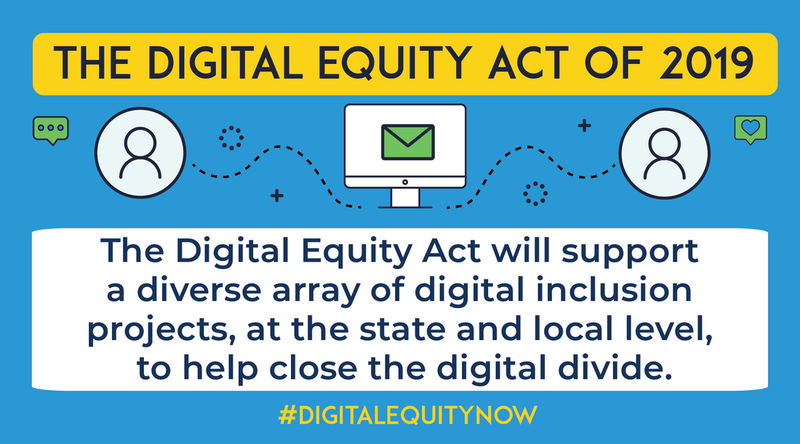 The Digital Equity Act of 2019 supports a diverse array of digital equity projects at the state and local level to help close the digital divide. 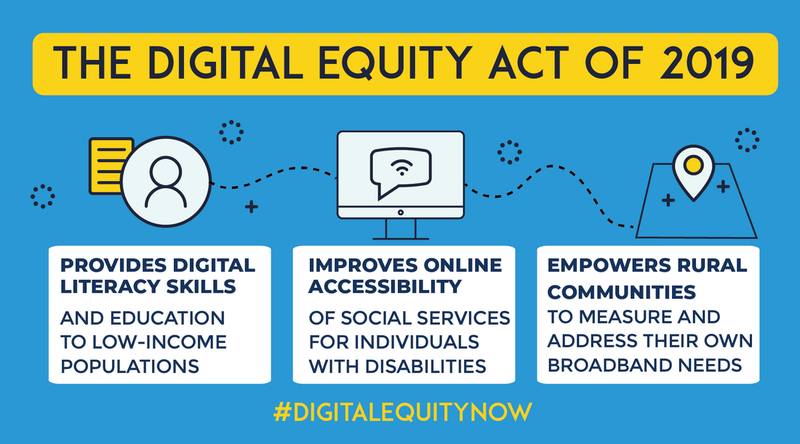 These projects may range from providing digital literacy and digital skills education to low-income populations, improving the online accessibility of social services for individuals with disabilities, to more accurately mapping broadband access and adoption in rural communities. Building Capacity within States through Formula Grants: The legislation creates an annual $120 million formula grant program for all 50 States, the District of Columbia, and Puerto Rico to fund the creation and implementation of comprehensive digital equity plans in each State. 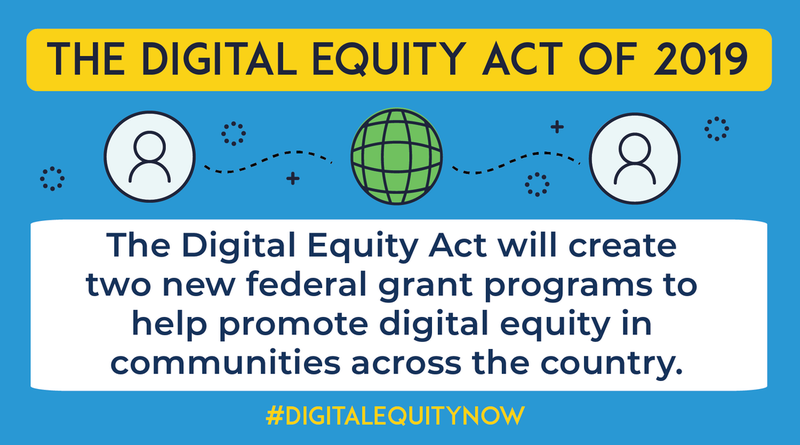 Spurring Targeted Action through Competitive Grants: The legislation also creates an annual $120 million competitive grant program to support digital equity projects undertaken by individual groups, coalitions, and/or communities of interest. 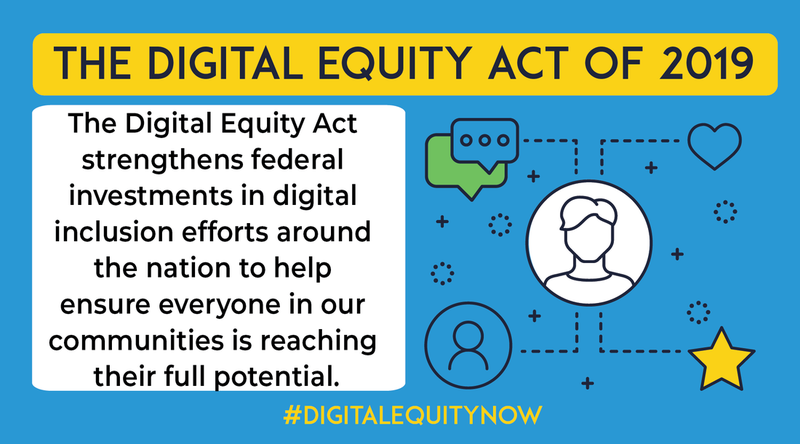 Supporting Research and Evidence-Based Policymaking: The legislation tasks NTIA with evaluating digital equity projects and providing policymakers at the local, state, and federal levels with detailed information about which projects are most effective.